There are many door hinge types and sizes available on the market, but how can you differentiate between their various features, to ensure you select the best model for your home. Perhaps the most common hinge types you will find in a typical home are pin hinges, washered hinges and ball bearing hinges. Pin hinges are a basic design for light weight doors, where the leaves (on either side) overlap the knuckle directly. If it is a loose pin hinge then this allows for the leaves to be separated and the door easily removed. A washered hinge is an upgraded version of the pin hinge. It works on the same principle, but incorporates small washers which are concealed discreetly in between the leaves and knuckle which make opening and closing the hinge somewhat easier. They also help increase the longevity of the hinge. 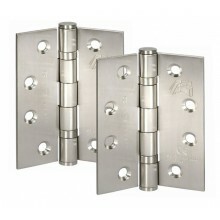 Also available are ball bearing hinges, which offer similar benefits to that of washered hinges. However enclosed within the knuckle are rings of ball bearings (instead of washers). This helps to distribute the weight over many smaller surfaces, which greatly assists when opening and closing the door. 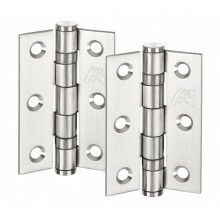 Ball bearing hinges also provide a smoother action and increase the longevity. 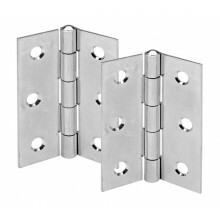 Remember that your hinges need to be able to support the weight of your door. Always check the weight capacity of the door hinges you wish to fit with the retailer or manufacturer before installation. If you are fitting hinges onto an existing door then it is worth considering the size of those already installed. It is not usually an issue to install larger hinges if there is sufficient room to do so, but you may wish to ensure they are at least equal in size, to ensure any existing fitting holes on your door and door frame are concealed for a neat finish. We hope this guide to hinges has been useful. For more information on door hardware, why not check out our earlier blogs on How to Maintain Your Door Handles and Replacing Door Handles on an Existing Door.